Each tablet contains: Ebastine: 10 mg. Excipients: lactose, sodium carboxymethyl starch, polyvinylpyrrolidone, magnesium stearate, hydroxypropylmethylcellulose, talc, titane dioxide, glycerine. 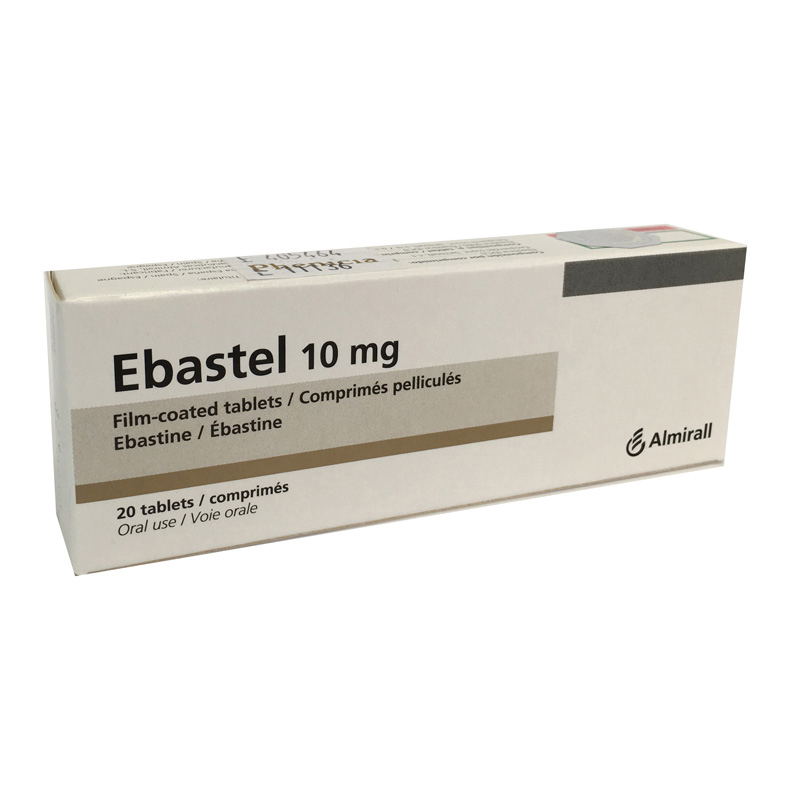 Ebastine, the active ingredient of Ebastel, produces a strong and prolonged selective blocking of the peripheral H1 receptors for histamine. The duration of its action allows to administer Ebastel once daily. The drug lacks any anticholinergic activity. Since it has not access to central H1 receptors for histamine, it does not show sedative effects. It does not strengthen alcohol effect either. Symptomatic treatment of allergic conditions, such as allergic rhinitis or conjunctivitis, both stationary and perennial (nasal discharge, nose itching, eye itching, weeping, sneezing, etc.) chronic urinary, allergic dermatitis. Known hypersensitivity to the active ingredient. Ebastel Tablets contains lactose. Cases of intolerance to this component have been reported in children and adolescents. Although the quantity present in the preparation is probably not enough to trigger the symptoms of intolerance, caution is recommended in case of diarrhea. Children: This drug must not be administered to children under 2 years old, since safety has not been established in this age group. Since Ebastine reaches its therapeutic effect 1-3 hrs after administration, it must not be used in urgent acute allergic cases. Ebastine can interfere with the results of dermal allergic tests and therefore, it is recommended not to perform these tests until 5-7 days after treatment discontinuation. It could strengthen the effects of other antihistaminic agents. Pregnancy: Since the teratogenic risk cannot be completely excluded, this drug must not be used during pregnancy, unless it is absolutely necessary. Lactation: It must not be administered to breast-feeding women either. It can rarely cause cephalagia, asthenia, nervous excitement, gastric intolerance, diarrhea and constipation. Adults and children older than 12 years: 1 tablet (10 mg) once daily. Children from 6-11 years old: ½ tablet (5 mg) once daily. The solution form can also be used. Children from 2-5 years old: For this age group, the use of the solution form is recommended. There is no need for dose adjustment in patients with liver function disorders. Instructions for use and handling: Ebastel tablets are scored in order to allow breakability and administration of the 5 mg dose. Single doses of 50-90 mg (5-9 times the recommended therapeutic dose) have been well tolerated and do not affect vital constants. Up to date, no case has been reported on Ebastine intoxication. If there is any sign of intoxication, proceed to gastric washing and administration of the appropriate symptomatic maintenance treatment.